Scientists use “renewable” energy to refer to energy that can be renewed in a human timescale. It’s energy from sources that are naturally replenished. That includes solar power, wind power, hydro power, geothermal energy, and biomass sources (such as burning of wood and wood waste; biodiesel, ethanol, landfill incineration, and biogas). While most renewable energy sources are cleaner and better than fossil fuels, some forms of renewable energy—especially biodiesel, ethanol, and anything that burns trash or organic material—still contribute to carbon pollution by releasing carbon emissions. Whereas, renewables altogether have reduced U.S. carbon-based pollution by 31 percent during this country’s recent drop in emissions, which was observed as between 2007 and 2013. The best energy sources are those that are inexhaustible, and emit little to no pollutants, do not create hazardous waste, and are not a danger to existing infrastructure and ecosystems. Examples of energy that are renewable AND clean, green, and sustainable include solar and wind energy. Natural gas and nuclear energy are mistakenly called “clean energy” but, unfortunately, they both have all kinds of problems when it comes to creating harmful, direct and indirect impacts on both the environment and human health. There are two renewable energy sources that stand out—wind and solar. Wind and solar are clean, safe ways to harness the infinitely abundant energy that is all around us. Wind and solar energy installations do not disrupt ecosystems, such as hydroelectric plants do, nor have the potential to cause earthquakes like geothermal energy drilling processes do. The use of the two clean energy sources also save billions of dollars on health costs in the U.S., compared to using fossil fuels—totaling $35 billion to $200 billion between 2007 and 2015. 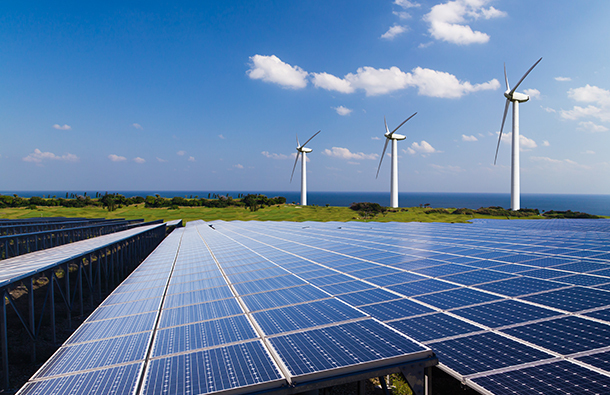 Continuous growth in both industries have been making it possible for more countries, organizations, businesses, communities, and individuals to take advantage of these two sustainable energy resources over fossil fuels. In 2016, the world spent $297 billion on renewable energy installations—more than double the $143 billion spent on new nuclear, coal, gas, and oil. By 2040, at least 40 percent of all the world’s power will come from renewable energy like wind and solar—and that number may well be 50 percent by 2050. Wind and solar are the clear solutions to reducing carbon pollution and slowing climate change. If you’d like to support the nation’s transition to a clean energy economy and reduce your carbon footprint, sign up with CleanChoice Energy. We source electricity for homes and businesses from wind and solar farms in the regions as close as possible to where our customers live. Learn how you can switch your home or business to 100% pollution-free, renewable energy today!